Origin and Habitat: Mammillaria prolifera subs. multiceps is found in the extreme southern texas and Mexico all along the Rio Grande from its mouth to the mouth of the Pecos River, extending north along the Gulf Coast of Texas to near Rockport, but growing only in a narrow band of coastal plain extending not over a few miles from the beach. Habitat and Ecology: In Texas this cactus grows in two widely differing habitats. It grows in or near the Rio Grande Valley in submontane scrub, usually in rich, deep, lowland soil where it seems to prefer the shelter of thickets, or else between the clumps of coastal grasses on the low, flat coastal plain almost within sight of the Gulf. It is quite inconspicuous but has a very large extent of occurrence and is abundant. Although there are threats in places (habitat destruction through logging), they are not sufficient to warrant any concern. Description: Mammillaria prolifera subs. multiceps is a small, spherical to egg-shaped cactus attaining a height of approximately 6 cm. It is easily recognized by the flexible, hairlike, radial spines that cover its surface. It blooms freely for many weeks at a time in spring, and for months after that its brilliant, scarlet fruits will be popping out to decorate it. Flowers are small and not highly coloured, dirty yellow or almost tan. 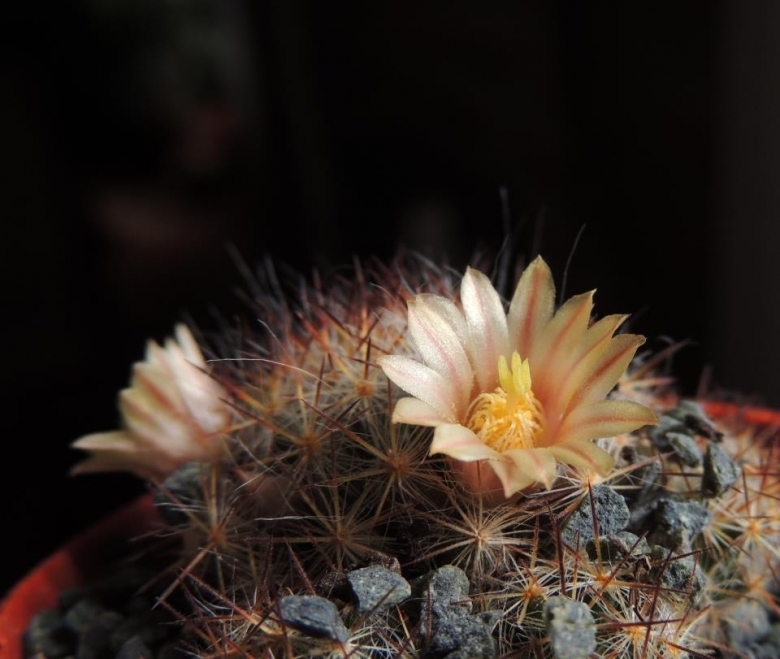 Taxonomy: This particular little cactus of Texas and northern Mexico was first described by Prince Salm-Dyck in 1850, and he called it Mammillaria multiceps. It would have seemed that it could have had a history unconfused by name troubles. There seem to be two rather distinct growth forms of it in Texas (also called Mammillaria prolifera subs. texana) and northern Mexico. The two forms seem identical except that one of them has the outer parts of the centrals dark brown, red-brown, or black (mainly from coastal and Valley habitat in Mexico), while the other has the centrals all whitish or else translucent, honey-yellow (mainly from the summits of the high hills in the Texas). Plants of these two different colourings seen side by side are conspicuously different, and the difference has been noticed by several authors. However the two forms grow together on the same hillsides, in a few cases (for example the two forms grow together in Potrero Canyon in the Santa Rosa Mountains of Coahuila, Mexico), so these two cannot be separated. They appear to be merely growth forms, perhaps simple phenotypes of the same variable population. (Weniger 1969). Habit: It is a low growing cactus, commonly branching to form colonies or cushion. Even though it sometimes produces clumps up to more than 30 cm in diameter, it is always an inconspicuous cactus. Stems: The individual stems dark green, globose, cylindric or club shaped to to 5 cm high, 1-5 cm in diameter, of soft texture. The main stem off-sets extremely rapidly so that a typical plant consists of a dozen to more than a score of different-sized heads forming a large, low, matlike clump. Tubercles: Cylindrical to conic, about 8-12 mm long, spreading, without latex, Axils of tubercles with several long, hair-like bristles. Areoles: Dimorphic. The spiny portion on the tip of the tubercle is round, with white wool at first, later naked. The floral or vegetative portion in the axil of the tubercle produces with the flower some wool and usually several long, twisted, white, hairlike bristles which persist. Radial spines: 30-60 (sometimes op to 80), hair-like in several series, often intergrading with the centrals, straight or twisted, white to yellow, 3-12 mm long. Central spines: 4 to 12, needle-like, comparatively heavy with bulbous bases, 4-9 mm long, much stouter than the radials, straight, white to yellow to reddish, with darker tips, usually somewhat pubescent, and spreading in all directions. Flowers: 10-25 mm long, borne in old axils but toward top of plant, small, brownish-yellow or almost tan, with pinkish to mauve-rose streaks. The petals have cream or can edges shading into pinkish or dull rose midlines. Inner perianth-segments usually un-fringed erect, pale yellow, with brownish mid-rib, acute, outer ones may occasionally have a few cilia on their edges. Filaments yellowish or white; anthers yellow at first deflexed inward; style shorter than filaments. Style cream-colored and short, stigma-lobes 3-8, cream-colored to yellow. Fruit: A many-seeded, egg-shaped to club-shaped, scarlet berry crowned by persistent withering perianth, somewhat curved, 12 to 18 mm long. **Seeds:*** Black, pitted, about 1.5 mm long, a little depressed; aril white, triangular.